Cyber Week Deal! Celebrate Cyber Week Dec 2-7 with FREE SHIPPING on all Wicked Ticket orders! Valid Monday, December 02 through Saturay, December 07, 2013. Simply enter code TNCYBERSAVE2013 at checkout to receive free standard shipping! This free shipping code provides Wicked Musical tickets of any order for the shows of your choice, on your preferred date, in advance, from your home. 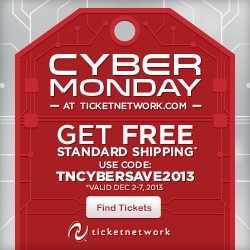 Buy Wicked Tickets Online, Use Code TNCYBERSAVE2013 for FREE STANDARD SHIPPING on all orders from Monday, December 02 – Saturay, December 07, 2013. This entry was posted on Saturday, November 30th, 2013 at 12:12 am	and is filed under Uncategorized. You can follow any responses to this entry through the RSS 2.0 feed. You can leave a response, or trackback from your own site.